The SnapComms platform is designed for maximum engagement by your staff with your content. Built-in features provide additional capabilities to make your messages more relevant, compelling and persuasive – delivering you even greater results. Below is a list of features available with SnapComms, some of which are channel-specific. Messages may be sent to the whole organization, individual employees, groups of employees, teams or any combination of these. Exact targeting ensures your important communications get delivered to only those employees who need to see it – improving relevance and reducing disruption. Existing employee groups from your staff Active Directory can be uploaded, or groups can be created manually. All groups set up are then saved for easy re-use at any time. Messages can be set for delivery at any future date and time. This could be at either a single fixed time, or at different times specific to each timezone (for messages with wide geographic reach). This allows communicators to ensure their messages are read at the time desired (if messages are embargoed until then) or at times when employees are most likely to read them. Repeat scheduling allows recurring messages to be published regularly on a specific day at a specific time. If multiple channels are being used as part of a larger campaign, each channel can be scheduled for different delivery times to maximize readership. Pre-configuring messages in this way makes delivery fast and simple when needed. Repeat until read! Messages may be set to recur at intervals until employees interact with them. For many channels, this means a pop-up notification being repeated until staff acknowledge readership or submit a response. For important communications which staff must read, this feature is essential in overcoming employee inertia or them actively or inadvertently ignoring messages. Customize message templates to incorporate your brand colors, fonts and style. Theme messages with eye-catching images and logos. As well as making your communications more visually-appealing to staff, which enhances readership, the addition of custom branding also conveys a professional appearance to align with your parent or external brand. Take advantage of real-time insights to improve communication effectiveness. Reporting options show performance of message delivery, readership and engagement. Use this data to learn which content employees value. Communicators can access dashboard reporting for insights concerning areas such as message validation and success by device. Comprehensive reporting is available from an individual user level to a holistic view of overall campaign performance. Messages can be configured for display on desktop screens, mobile devices and digital signage. This multi-device capability guarantees reaching all employees with important messages. It’s a feature increasingly important with the array of different job types and environments in modern workplaces. 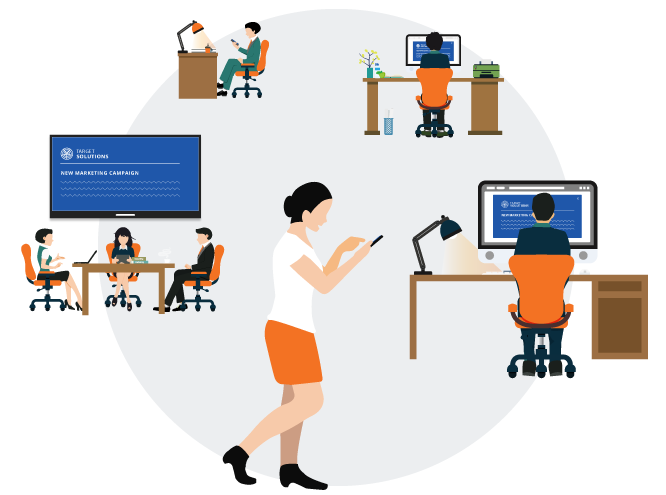 A growing number of employees are mobile, field-based or non-desk based – almost impossible to reach with traditional communication tools. Detailed reporting provides an analysis of message success by every device type targeted. Settings offer additional support for employees with disabilities, such as impaired vision. Compatibility with devices like screen readers ensure that the platform is accessible to everyone in the organization. Select from different message formats to deliver greatest visual impact and readership. This includes dedicated settings to optimize content for mobile device screens. Pop-up or push notifications can be set to appear on desktop or mobile screens, over full-screen applications and over locked screens, offering flexibility depending on the priority of the message. A range of already-created message templates allow communicators to begin sending messages immediately. Content is tailored to different industries and situations (for example, communicating change, IT outages etc.) for greater relevance. Just refine if desired, then send! Communicators can also create their own customized content templates, incorporating visuals and wording, to allow for quick publishing whenever required. Ready to get started with better internal Comms? 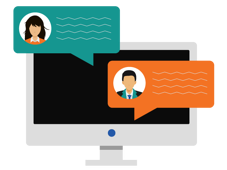 For a deeper dive into how SnapComms software will boost your internal communications, why not have a demo?